The AD-1 Auto-Draft*... 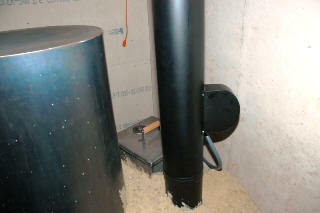 The most economical draft inducer for your wood burning stove. This action increases the negative pressure (draft) in the stove, preventing smoke from leaking out of pipe, seams or doors. Perfect for tough smoky "start ups". For use on coal and wood stoves, wood furnaces, wood boilers, pellet stoves** and most other solid fuel appliances needing additional draft to function more efficiently. With Auto-Draft your hard starting stove draws immediately. No smoky back up even with moist hard to ignite types of wood. Once the fire is burning, adjust the variable speed control knob on electrical box for maximum efficiency of your stove. Auto-Draft provides for total utilization of your wood, leaving only a fine ash residue in most cases. No more smoke...Turn it on to load wood or during a draft issue, and then shut if off. The fan is only pre wired to the speed control…. There is no “plug-in” cord off the control box, but the unit only draws .8 amps, so a wired plug can be attached to use a close wall outlet. A conduit pipe should be part of the electrical installation, mostly to protect the cord from touching and accidentally melting on the hot flue pipes. **** Ventilation manufacturers produce a wide variety of draft inducers for gas and oil appliances. Tjernlund, a leading and innovative presence in this field, has introduced a draft inducer for wood and coal applications. Tjernlund has taken their model D-3 and modified it for the much needed task of draft assisting the common free-standing wood stove. The D-3, DJ-3 and other models, even similar from other manufacturers, are not recommended for a solid fuel environment. The AD-1 can be identified by its BLACK heat treated paint finish and adjustable speed control. Right now, this is the only manufacturer recommended draft inducer for this application. .... and the most economical compared to duplicating it with standard similar looking fan models and additional controls.